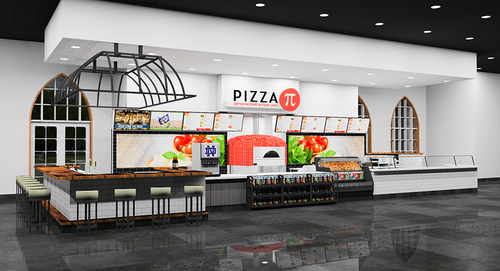 Campus Dining and Student Government announced today that Pizza Pi will open May 2019 on the south side of South Dining Hall in the former Reckers location. Pizza Pi is a new concept from Freshens. 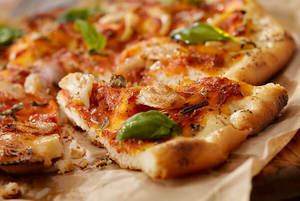 Offerings include craft pizzas, salads, baked pastas, breadsticks, smoothies, and desserts. Beer and wine will be served on the weekends. Pizza Pi will be open 11:00am to 2:00am Sunday through Thursday and 11:00am to 3:00am on Friday and Saturday. Over the next five months, the restaurant’s space will undergo an extensive renovation to create a sleek, modern environment centered around a new Italian-designed pizza oven. The bright cafe will offer counter and booth seating inside and a redesigned outdoor patio. Pizza Pi will open in May, just in time for graduating seniors to enjoy it before commencement. Continue to visit dining.nd.edu throughout the spring semester for construction updates and news. Originally published by Molly Moran at dining.nd.edu on December 09, 2018.